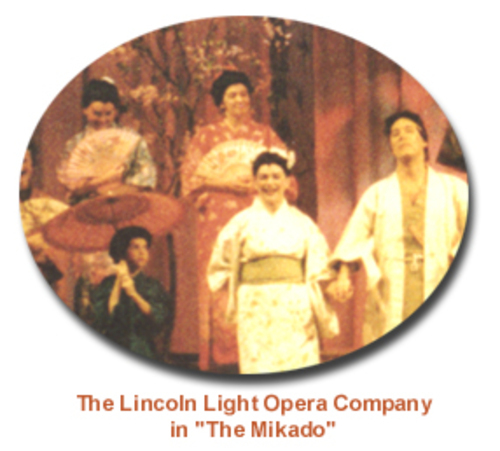 Created in the summer of 1981, the Lincoln Light Opera presented many complete and abridged versions of the beloved Gilbert & Sullivan operettas, including The Mikado, H.M.S. Pinafore, trial by Jury, Pirates of Penzance and Ruddigore. These were presented in dinner theater productions and orchestra concerts in Lincoln and surrounding areas. The LLOC also offered a number of Americana revues including In the Good Old Summertime and Love's Old Sweet Song. It has been on hiatus since 1999. When it comes to topsy-turvy fun, The Lincoln Light Opera is the show for you! For twenty years the ensemble has performed the popular works of Gilbert & Sullivan in dinner theaters, revues and orchestral concerts. “Trial byJury,” “H.M.S. Pinafore,” and “The Mikado” have received full productions on several occasions, often with long performance run schedules. Lincoln’s Cotner Center and the Lincoln Hilton (now Holiday Inn) hosted six of the productions in the 1980’s. Since the early 1990’s the company has offered “Here’s a How-de-do!” and “A Savoyard Singalong” to regional audiences. Both programs, which can be done with piano or orchestra, offer a generous sampling of Gilbert & Sullivan’s most famous melodies from “The Gondoliers,” “The Yeomen of the Guard,” “Iolanthe,” “The Pirates of Penzance,” “The Sorceror,” “Patience,” “Princess Ida,” and “Ruddigore,” as well as the aforementioned musicals. Often, the second half of the program consists of highlights from “The Mikado,” done in full costume. Audience members are given songsheets to use in singing some of the music. The Lincoln Light Opera has been guest artist with the Lincoln Civic Orchestra numerous times, and also with the Nebraska Chamber Orchestra. Subject of many newspaper articles as well as radio and television broadcasts in eastern Nebraska, the company is listed with the official Gilbert & Sullivan Archives on the internet. H.M.S. Pinafore in dinner theater at the Hilton Hotel, summer 1988. 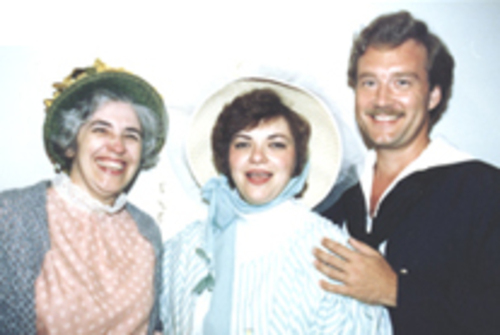 Pictured are Phyllis Spahn, Wanda Mandigo and Malley Keelan. The Mikado This Cotner Dinner Theater production was performed nearly 25 times between 1983 and 1994. Gilbert & Sullivan's first big hit in 1875, it is a spoof on the British court system. 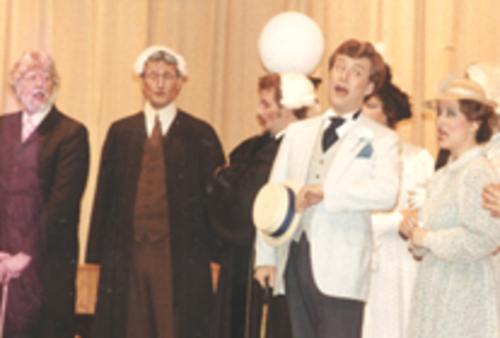 This production was with the new Cotner Dinner Theater in 1983.